On May 7, I will be working with Infopeople to offer a webinar. It's part of ELF 2.0, the Early Learning with Families initiative of the California State Library. My webinar is STEAM in the Public Library: Programs & Services for Children. I'll be talking about STEAM programs and services for preschoolers and school-age children; how they fit with library missions and goals; and resources for any staff member to start adding STEAM to their library right away. For full information about this webinar, head over to the Infopeople webinar description page. The webinar will be archived for those unable to attend the live session. This past Friday, I was able to attend the second annual School Library Journal Public Library Leadership Think Tank. 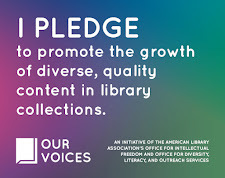 The day-long event focused on the theme of "Accelerating Your Impact"--namely, making library services more meaningful and impactful for our communities. I'm going to be thinking about everything that happened at the Think Tank over the next week or so, and then I'll post some larger, more thought-out posts throughout May. For the time being, however, I wanted to note a few big thoughts from Gretchen Caserotti's keynote. I'd love for fellow attendees to chime in in the comments! "Fill your well." - It's important to take care of yourself, to do things that are for yourself, and to take things in and live in the moment. If we don't center ourselves first, we can never really focus on others. Taking care of ourselves is the first step toward excellent customer service. "Avoid drama. Just because we work with young people doesn't mean we should act like young people. If we act like young people, we run the risk of being infantilized and not taken seriously as professionals." - Yes. Just, yes. We need to be mindful of always conducting ourselves as professionals and not get sucked into workplace/organizational/association drama that looks exactly like the gossip and fights our kids and teens have. "You don't need to be a manager to be a leader." The two are not necessarily synonymous, and you can be an outstanding leader for your organization from any position. It's about doing excellent, transformative work and motivating/facilitating others to do the same. I visit local preschools and early childhood centers to provide outreach story times on a pretty regular basis, which means that, over the past few years and the course of many visits, many kids have chosen their favorite story time songs. I recently had a high number of kids requesting one song in particular, so I decided to make that tune my latest ukulele accomplishment. 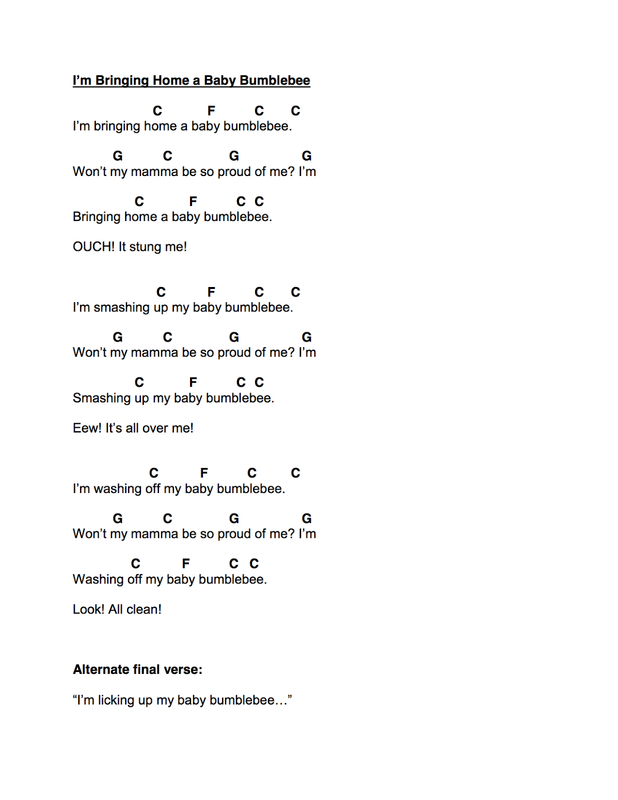 Ladies and gentlemen, "I'm Bringing Home a Baby Bumblebee" for the ukulele! 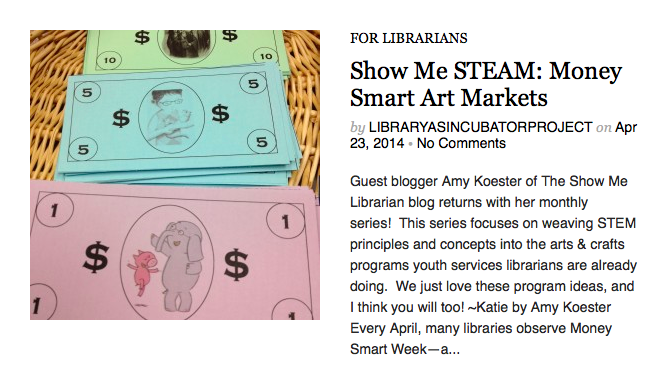 I'm over at The Library As Incubator Project today talking about how we celebrated Money Smart Week at my library this year: we offered Art Market activities in programs for both school-age and preschool children, and they were a hit. Head over to LAIP to get full details on how these program activities worked, and consider adding some math and financial literacy to arts and crafts activities at your library! Today I'm sharing an upcoming release from author Shirley Reva Vernick. I very much enjoyed this novel, and I can't wait to book talk it to my teens. The Synopsis: Penny's Christmas break is not going according to plan. Her mother, off on a ghost hunt in Idaho, has deserted Penny for the holiday and sent her to a bed and breakfast on an island in Maine owned by a woman she's never met. Things couldn't possibly get any worse, thinks Penny--until two unexpected things happen, that is. Romance and ghosts; they can turn any isolated holiday into an adventure. 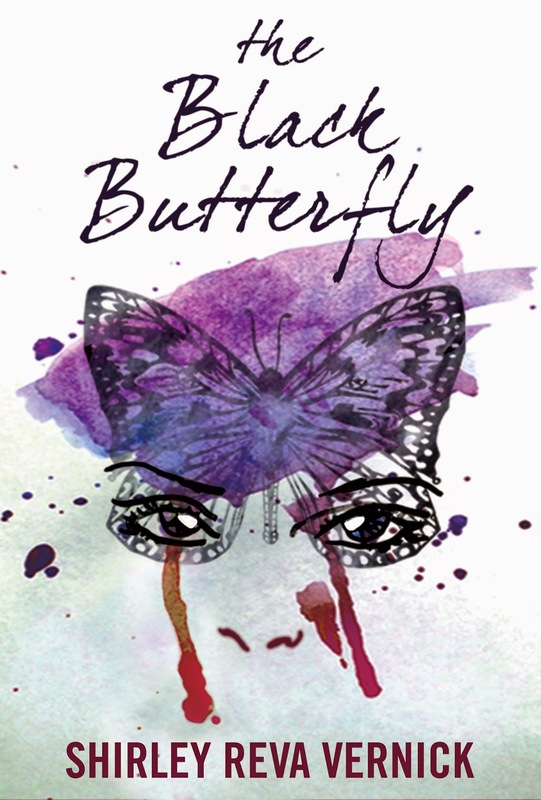 The Review: This book is highly enjoyable and hits all the right notes for a teen reader. Penny's voice rings so true, bouncing back and forth between anger, intrigue, excitement, gratefulness, and everything in between. The plot has great variety, too, with a few unexpected ghosts, slowly-revealed family histories, and the forging of new friendships. All of these aspects are well balanced, with nothing feeling out of place or overdone. The bed and breakfast is well-drawn, adding a great sense of place to the story. There's also a perfect amount of kissing in this book, which I, and many of my teen readers, enjoy. The Programming Connection: I'll be book talking this title lots in coming months, especially when the cold Maine winter will provide an excellent literary escape from the hot Missouri summer. I imagine my readers who enjoy Myra McEntire will be particularly pleased with this addition to our shelves. Digital review copy provided by the author. When I was putting together my preschool science program on the topics of counting and measuring, I knew I wanted to share a story dealing with pizza. Then it hit me--a felt story would add just enough extra oomph! So that's what I did. My felt pizza story involves some of the base ingredients of pizza--flour for dough, tomato for sauce, and cheese for topping. I also made some slices of onion, green pepper, and pepperoni (all some of my favorite pizza toppings, not coincidentally). I've found that this simple felt activity can be used in so many different ways. It can be a story, narrating the process of building a pizza from start to finish, with all the great cooking vocabulary. 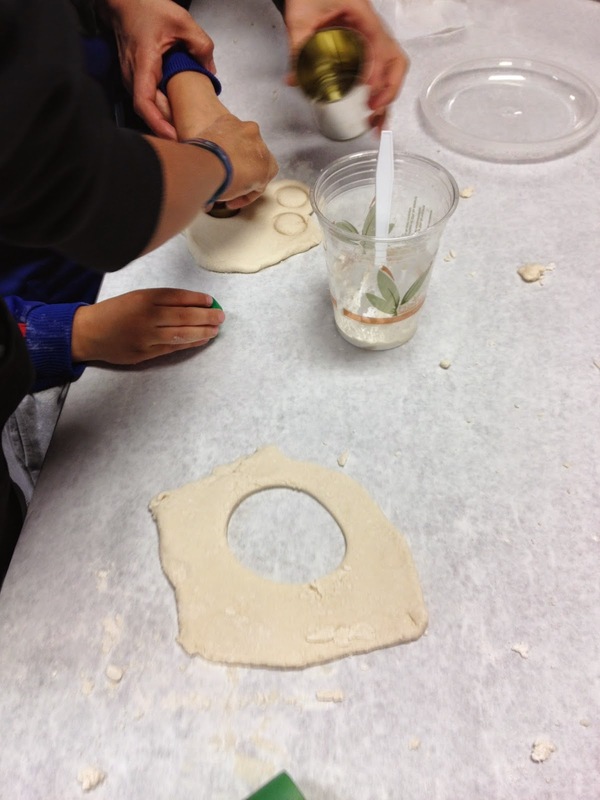 It can be a counting activity, doling out the toppings. It can be used as a cumulative tale, too. Not bad for a pretty quick flannel project. Check out this week's full Flannel Friday roundup on Lisa's blog Lisa's Libraryland. The Synopsis: Regardless of a person's reasons for going vegetarian, there's a lot of nutritional thought that needs to go into the decision and the upkeep. 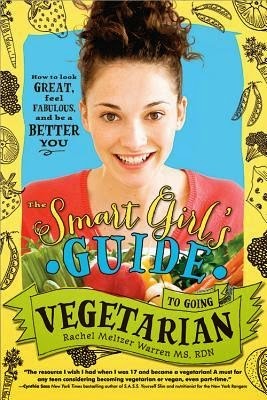 This comprehensive title explores the spectrum of vegetarian eating and lifestyles, then dives into the details of how vegetarians--young girls in particular--can meet all their nutritional needs while making the food decisions they want. The title includes excellent resource lists as well as plenty of recipes to get any new vegetarian started going veg healthfully. The Review: Man oh man, I wish this resource existed when I was a middle schooler. It's completely accessible in its language, tone, and scope, always taking an individual's food choices seriously and never verging on condescending. I'm also quite impressed with the tips and ideas peppered throughout the text, including things like how to approach the school cafeteria or a restaurant menu when you're a vegetarian. The variety of recipes are outstanding, too. The Programming Connection: The volume would fit well in a teen program on food and nutrition, a topic of interest to a number of the teens who frequent my library. The Synopsis: Lucy's family are a musical bunch, what with their listening preferences (opera for her dad) and proclivity for singing. Lucy doesn't sing, however, instead channeling her energies into poetry. When Lucy and her family travel to their Aunt Frankie's to help her during the river's annual flood, she encounters an aspect of nature than she's ever before experienced. She also learns the power of words and song when her toddler brother wanders away during the flood. The Review: In true MacLachlan fashion, this quick, spare story introduces a heartfelt, captivating character, her family, and her inner thoughts. Readers will hear truth in Lucy's insecurities, her need for a secret between herself and her brother, and her strong, strong love for her family. The Programming Connection: I could connect this title to STEAM areas in two different ways: with the flood connection (science of extreme weather), or with the poetry and music aspects of the book. Some of you may not know that I am a huge Jane Austen fan. My love of all things Austen doesn't come up that often here on this blog, as most Austen content is aimed at an adult audience. That changes today, however, as I review today's title. The Synopsis: Elizabeth (Lizzy) Bennet and her sisters, living in Georgian England, have their lives just about turned to chaos when their mother learns that Mr. Bingley--a very eligible bachelor--has moved into the neighborhood. The social world of a single Regency woman revolved around marriage prospects, and Lizzy Bennet is no different. 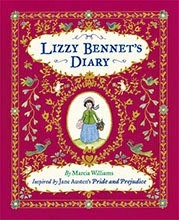 This book constitutes her diary, and it proves that all the marriage fuss doesn't mean Lizzy can't have her own opinions and interesting experiences along the way. The Review: Williams's diary-style interpretation of Pride and Prejudice is fair indeed. It keeps mostly consistent with the characterization from Austen's original--an important detail for me, since adaptations for younger readers need to represent everything that's excellent about the real thing. There are a few moments when Lizzy seems to think or say something that doesn't quite seem in character, but I attribute that to the liberties of changing a third person story to a first person internal narration. I've got no major complaints, which is a pretty big endorsement for me when it comes to an Austen adaptation. The Programming Connection: I'd book talk this title in conjunction with other diary-style novels, like the Dear America and Royal Diary series. It would also make a nice complement to a suite of historical novels. We've been celebrating Poetry Month with two of my favorite poetry-writing activities. And best of all, both involve library materials! If you're looking to add another activity or two to your own April festivities, give one of these a whirl! 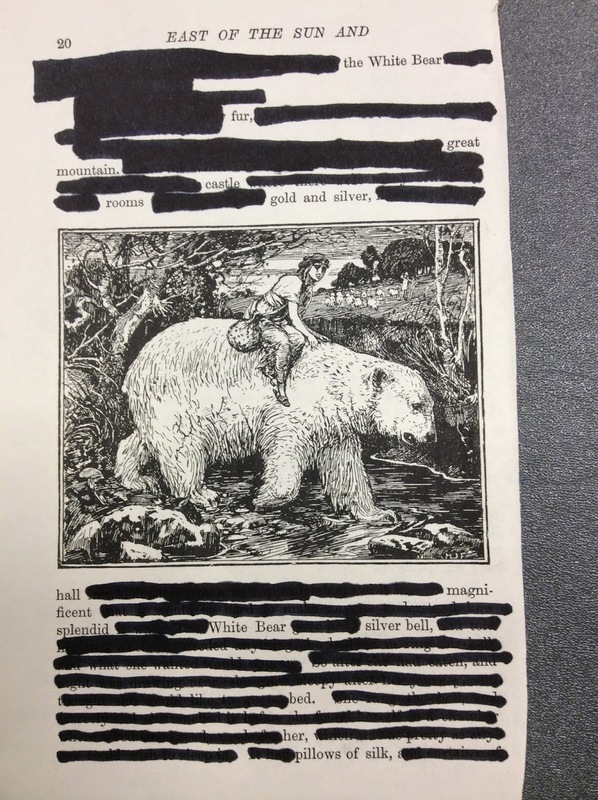 All it takes to create a blackout poem is a page from a book and a black marker. I've been mindful of what books I've had to withdraw for broken spines, missing pages, etc., and I set aside ones with "juicy" words specifically for use in this activity. In my program earlier this week, for example, pages came from The Blue Fairy Book and Harry Potter and the Chamber of Secrets. 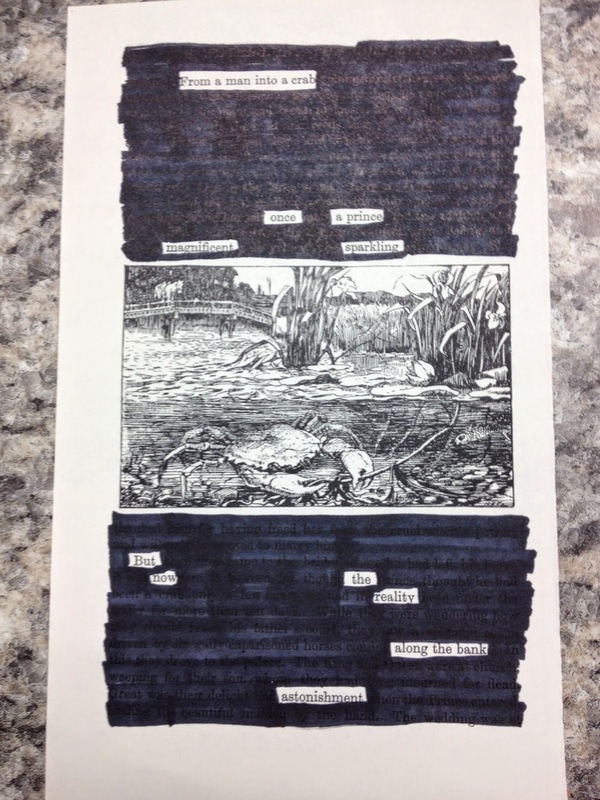 Once you've got your page from the book, the process is to black out all the words you don't want to use with your black marker. It's almost like making poetry with negative space--choosing the gems of words you want to use in your poem, and getting rid of the rest. What's so great about this activity is that it truly focuses on what words can do. You can't add words, and you can't change word order--what's on the page is what you've got to work with. I use this activity every year because it's so quick and fun. The premise is to find books on the library shelves, combine them with others, and use their titles on their spines to create a poem. 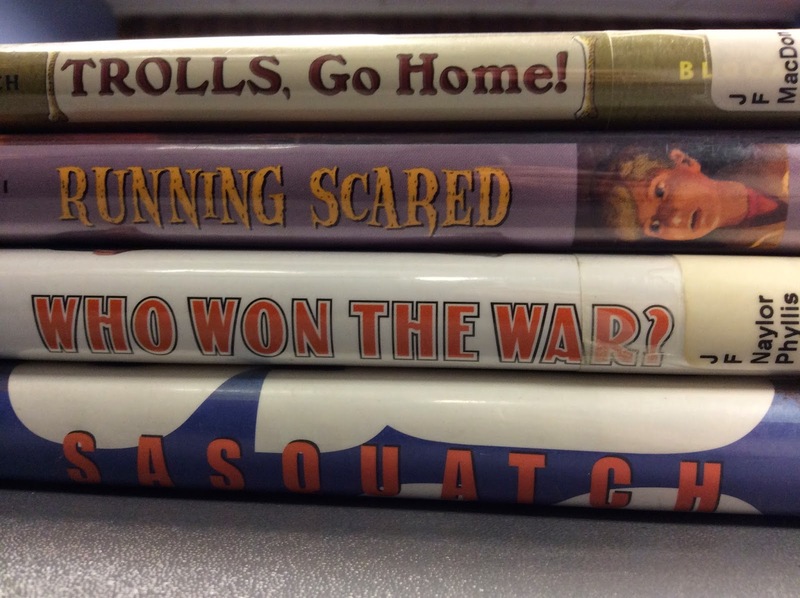 If you want lots of inspiration and some great book spine poems to read, check out Travis's annual Book Spine Poem Gallery over at 100 Scope Notes. What activities do you use with school-age kids to celebrate Poetry Month? Yesterday evening, I spoke to a group of school librarians at their monthly Library Media Specialist Academy meeting. My 2014 Mock Newbery school library co-facilitator arranged for me to speak on two specific points: the Newbery and my experience on the committee; and mock award programs in the library. I want to share here the variety of resources we discussed in the course of the presentation. Get mocking! Gather your kids. My 2014 Mock Newbery involved a group of around 3 dozen fourth- and fifth-graders, all of whom had been selected by their teachers and school librarian due to their past success at reading lots of state award nominees. 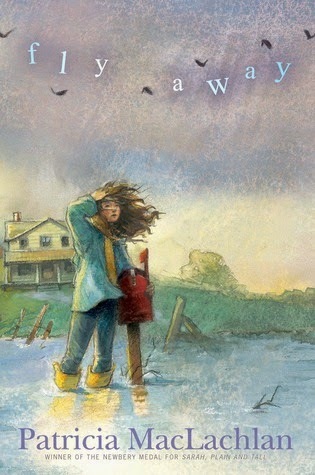 You can also arrange a Mock Newbery with individual classrooms, or entire grade levels. Choose your books. Great sources for choosing eligible books include Betsy Bird's Newbery/Caldecott predictions; the For Those About to Mock blog; the Heavy Medal blog; the Goodreads shelf of books tagged "newbery-2015" (or whatever award year you're looking for); and starred reviews from different journals. Procure some books. This could be all library copies, special non-catalogued copies, copies donated by Friends of the Library groups, or a combination. Explain Newbery criteria to the kids. I put together a simple sheet with terms pulled from the Newbery manual. Meet regularly for discussion. My school librarian Mock Newbery partner arranged for me to visit her school library once a month from September through December. Each hour-long meeting opening with some introductory material by me--usually reminders of criteria. Then we'd discuss, with emphasis on comparing our mock titles to one another. We usually wrapped up with some time for question. Arrange a voting party. Our voting party took place on a Saturday afternoon in January at my library--a great way to bring new faces into the public library. We had pizza; discussed books using the CCBC's Book Discussion Guidelines; and used a balloting sheet to vote for our winner and honor books. Celebrate your winners AND the real winners! Share your mock medalist and honorees with the school, at the public library, etc. Then make sure to tune in for the YMA announcement and report back to your Mock Newbery group. These are the resources I discussed during the course of my talk. Do you have additional resources that you think I should add to this list? Let me know in the comments and I'll edit them in! I've got a confession to make: I'm not doing such a great job as a reader right now. I suppose, in some ways, I have an advantage over other folks stuck in reading ruts because I know the probable cause of mine. I happily spent all of last year reading a ton, in a specialized and critical manner. And I know that I should give myself permission to take a break from reading for a while now that that intense reading year is over. But the thing is, I don't want to take a break from reading. I love books. I just can't seem to get into them right now, and that's really disappointing for me. I love reading a great book. I love getting to know the characters, inhabiting the world of the book. I love the surprises, the twists and turns of an excellent plot. I love great language, the conversation between characters. I love reading. I just can't seem to find the right book for me right now. Which has given me opportunity to think a bit about the readers' advisory aspects of youth librarianship. Namely, do we give kids space to be struggling as readers? Do we recognize, in the way we do our jobs, that a reading life is fluid? That it's not all the same all the time, with readers and reluctant readers statically on two ends of a spectrum? Because what my personal reading rut is affirming for me is that if there is a reading spectrum, it's spherical and we each individually move across and around it all the time. Sometimes our preferred genres may very; sometimes we may only want to reread favorites; sometimes we voraciously read anything we can get our hands on; and sometimes we just might not be able to get into anything at all. It's all normal. The reading life is a fluid one. So while I try to claw my way out of my own reading rut, I'm going to slow down in my readers' advisory interactions with kids to make sure I'm listening to what's happening in their reading lives, and to do everything I can to help them find the right book right when they need it. I'm over on the ALSC Blog today sharing the details of my recent preschool STEAM program on the topics of counting and measuring--both basic math skills that are important to many science activities. Head over to the ALSC Blog to steal this program! Allow the caregivers to enjoy content geared to them. Provide thematic crafts/activities for kids so that caregivers need not find childcare to attend the adult program. End programs with an invitation for the family to continue the program exploration at home, whether through conversation or related activities. The joint activity: What's the herb/spice? Michele created a poster board with images of 16 herbs and spices used in different types of cooking. She also created a sort of game page, with spaces to guess all 16 herbs and spices based on their pictures. For additional clues and interest, she also set out plates with all 16 of the herbs and spices. Smelling, carefully grating, and feeling the foodstuffs were all acceptable means of exploring what the herbs and spices were. The goal was for families to work together to explore these foods, talking about what they were, what they smelled like, what they use them for in their house, etc. 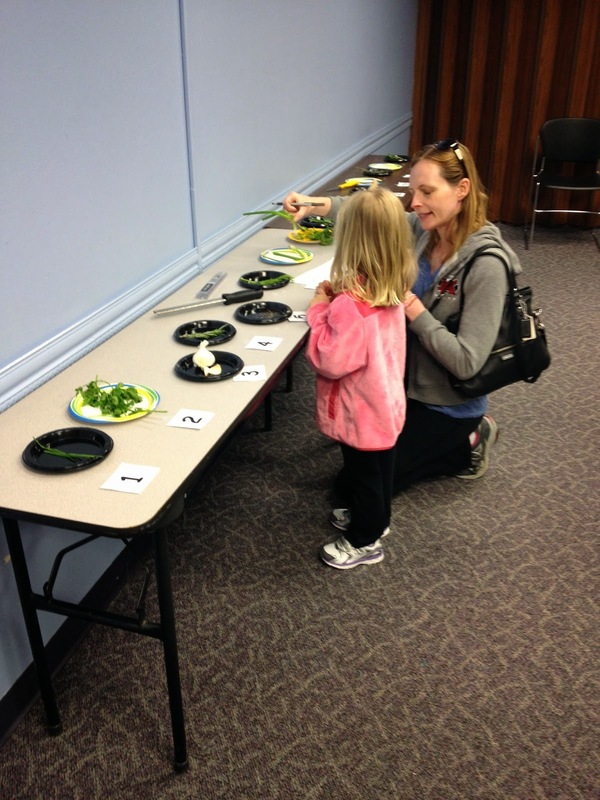 This hands-on and self-paced activity provided great ways for families to use food vocabulary and to talk about their own food traditions. The advertisement for the program encouraged attendees to bring a printed copy of a recipe or two that they enjoy at their own homes. At the beginning of the program, a library staffer ran off copies of each of the recipes for everyone to swap. There were pasta dishes, a breakfast sausage recipe, some baked goods, and a sweet and sour pork recipe, all with recommendations for their ease, healthfulness, and kid-friendliness. Michele also called in and displayed a wide variety of cookbooks in the library's collections to share with attendees. They were then able to talk about their favorite recipe sources--cookbooks, blogs--and swap personal tips for the best stores for certain ingredients, keeping meals well-balanced, etc. So many caregivers try to be cognizant of the types of foods they share with their families, and so this topic produced tons of conversation. I created a blank, half-page recipe card template in Publisher and printed a bunch on white card stock. I had the library's washable, large-size ink pads on the craft table, ready for kids to do fingerprint art to decorate the backs of the recipe cards. I also had plenty of wipes on hand for when the artists wanted to switch to a new color of ink. The end result was a great variety of personalized, colorful recipe cards, ready to be used to share favorite family recipes. This craft is a pretty straightforward one for the crafters, so we were able to talk about our favorite foods and how we help cook and bake at home while working on our recipe cards. Michele shared a recipe for chocolate crinkle cookies in the recipe swap, and she prepared a batch to share at the program as well. Kids and adults reconvened to try the cookies, which provided a nice end to our joint programming adventure. Do you partner with adult services to offer simultaneous or inter-generational programs? I'd love to hear about them!